James Wilcox IV, a 28-year-old Army veteran, lives in Tacoma, Washington, as he wraps up his undergraduate degree in history at the University of Washington. His father is a fourth-term Washington state legislator, and his family has owned a farm since 1909, which today specializes in cage-free, organic eggs. According to his friends, Wilcox enjoys debating politics, and he describes himself as a moderate Republican. Wilcox has company; 31% of American Republicans agree that humans are a major driver of climate change, according to public opinion research by the Yale Program on Climate Change Communication, which publishes this site. While it’s tempting to stereotype one’s political opponents, Wilcox is an example of those who present an opportunity to galvanize bipartisan agreement on climate change. 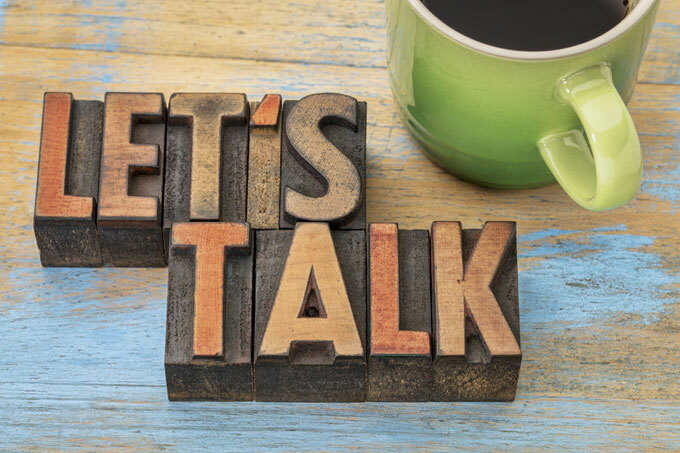 Extreme voices often grab headlines and stoke social media wars, but productive conversations take place more quietly, allowing a glimmer of optimism amid our seemingly intractably partisan politics. Useless gestures? Or concern for legacy? Kraus and Wilcox share more in common than might be expected for people with opposite political affiliations, a wide generational gap, and hometowns at opposite ends of the country. All the more reason to have them sit down for a video call and share their perspectives. This is the fourth in a series of Common Ground conversations, wherein people with different outlooks on climate change come together for an open dialog. See the preceding three parts. 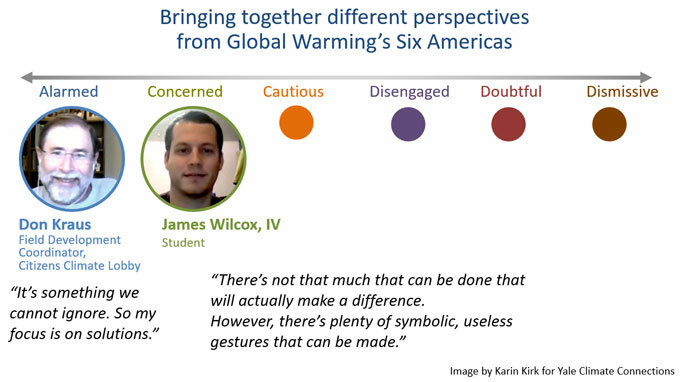 Before their interview, Wilcox and Kraus rated themselves on the Six Americas spectrum. Image adapted from Six Americas study. 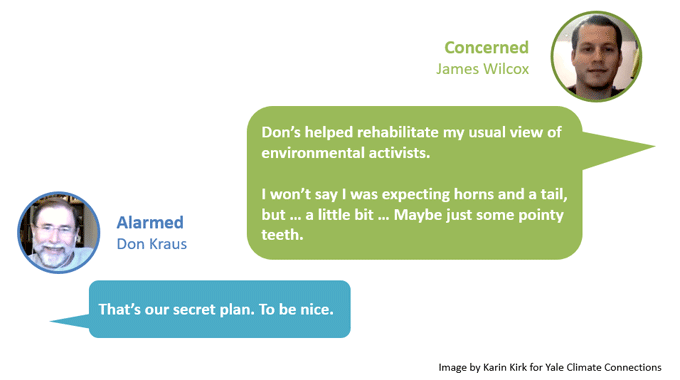 Wilcox and Kraus see many issues similarly, as was revealed by their responses to a questionnaire they completed prior to their conversation. They both agree that climate change will have negative impacts on their lives, and they view potential “solutions” as generally beneficial. 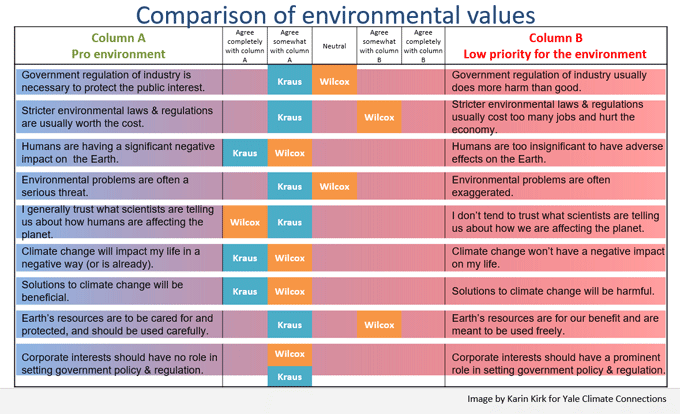 Wilcox and Kraus rated their own values on environmental themes. Responses that fall toward the left side of the table reflect a strong commitment to environmental issues. Responses toward the right side represent a lower priority or lack of trust about environmental issues. Interestingly, when it comes to trust in scientists, their positions are swapped from what one might expect. Both are inclined to accept what scientists say, but Wilcox has a greater sense of trust than Kraus. This is a promising stance from a Republican, and a good reminder that partisan stereotypes don’t apply to everyone. Kraus largely agrees but is slightly hesitant, unsure about climate models. “We’re still figuring it out,” he says of the scientific community. Indeed, the two are close together, but a Republican leaning on a progressive to trust climate science is an interesting role reversal. Wilcox and Kraus differ most on the economic impact of environmental regulations. With deep roots in his family farm, Wilcox reflects the rural perspective, “The people who get hurt the most by environmental regulations are farmers or people who live and work in rural areas,” he says. Wilcox acknowledges that environmental interests play a role in his home state, but he feels they fall short when it comes to earning support from rural populations. “The environmental lobby only cares what happens in and around Seattle,” he laments. Overall, the idea of a carbon fee and dividend has some traction with Wilcox: “It does make sense. I don’t feel qualified to address all the variables involved, but to me, yeah sure, it makes sense,” he says. Issues tend to be driven by their messages, which, on either side can be distorted well beyond the point of reason. Wilcox laments that what he regards as Republicans’ anti-science rhetoric is unhelpful. As high-profile Republicans acknowledge the problem and the need for solutions, it will get easier for others to follow suit. “Then you’re not a maverick, breaking away from the herd,” observes Wilcox. Wilcox himself may be just one of those messengers. He jokes that his friends are likely to post on Facebook to suggest that this year’s cold winter is evidence that climate scientists are wrong. He may not confront his friends directly, but Wilcox says: “I just passive-aggressively share articles” that support the idea that climate change is real. Wilcox bristles at the idea of fossil fuel projects like Washington’s proposed Millennium Coal Terminal being rejected because of environmental concerns, but he agrees that renewable energy offers a solution that’s compatible with the rural way of life. “There’s plenty of farmers in eastern Washington who are all for wind energy,” he says as he points to additional income earned by farmers who host wind turbines on their farmland. “Texas is the same way,” replies Kraus. Kraus and Wilcox relax at their point of ready agreement. Wilcox jokes, “Don’s helped rehabilitate my usual view of environmental activists. Indeed, being nice is a nearly sure-fire way to increase one’s odds of being heard and listened to. That approach can apply not just to one’s tone, but also to the crux of advocacy and policy. Is the policy – and the messaging – seen as punitive, or supportive? The answer may forecast the likelihood of success.